Home > Full Tilt Awesome! Military Jet Teams & a F-22 Raptor Demo, +++! Announcing the 2018 Thunder of Niagara Air Show, June 9 & 10, 2018! 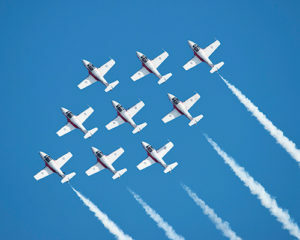 Featuring not one, but TWO military jet demonstration teams … the United States Air Force Thunderbirds and the Canadian Forces Snowbirds! 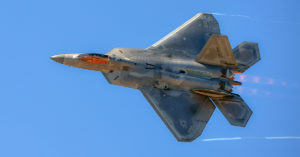 Plus, the F-22 Raptor tactical demonstration. Check out the details below and buckle up for two days of jam-packed aviation excitement! “The USAF Air Demonstration Squadron (“Thunderbirds”) is the air demonstration squadron of the United States Air Force (USAF). 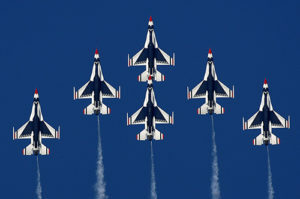 The Thunderbirds are assigned to the 57th Wing, and are based at Nellis Air Force Base, Nevada. “The Canadian Forces (CF) Snowbirds, 431 Air Demonstration Squadron are a Canadian icon comprised of Canadian Armed Forces (CAF) members and National Defence Public Service employees.